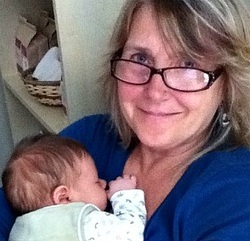 Debra Woods has a wealth of experience both as a doula and parent educator. I asked her to write an article on infants and the science of attachment. Enjoy! For generations there has been a very mistaken belief that ‘bad habits’ are created when parents respond to infants when they cry, hold them to comfort them and sleep with them. This idea stemmed from a time in our past when ‘the experts’ had very little actual research and therefore true understanding of infants. The theory was that infants were like blank slates, who didn’t feel emotions or pain and so parents could essentially shape them. Parents were advised to let their babies cry alone instead of responding to them, to put them on a strict feeding schedule instead of feeding them when they were hungry, as well as put them in a separate room to sleep through the night. In the 1960’s research began to emerge that shed new light on infants and their attachment needs. Yet the outdated belief remains entrenched in many people’s minds. New parents today still hear ‘it’s good to let them cry, it helps their lungs’, or ‘if you hold her too much, you’ll spoil her’, or ‘don’t pick him up every time he cries, he’ll get used to that’, and ‘don’t nurse your baby to sleep, you’ll always have to do it’. Parents feel confused and doubt their instinct to respond to their baby’s cries (as parents are hard-wired to do). The theory extrapolates that infants are capable of manipulation. This couldn’t be farther from the truth. Let’s look at the current science of attachment to dispel these myths about infants. Attachment as defined by Dr. Gordon Neufeld is the drive for relationship characterized by the pursuit and preservation of proximity. It’s an infant’s primal instinct to be close and keep close to their parent. It’s all about survival. When coming from the womb to the world, a newborn goes through tremendous changes and makes huge adjustments to life here. To feel safe and secure, to maintain a sense of the familiar, newborns need to be close to their parents. Every action a newborn takes is to ensure this contact happens. Research shows that the newborn’s systems – heart rate, breathing, temperature are regulated when they are kept on their parent, skin to skin. At birth our brains are ¼ the size of an adult brain – basically very underdeveloped, premature when compared to all other mammals. The 3 sections of our human brain are: 1) reptilian – responsible for basic processes and the fight/flight response, 2) mammalian – responsible for our learning about nurturing, caring, loving and where we experience our strong emotions like separation distress, fear & rage, and 3) neocortex – responsible for thinking, rationalizing, reasoning and talking. Infants & toddlers spend most of their time in the ‘reptilian’ and ‘mammalian’ parts of their brain. This is significant because it’s in these areas where they first learn about trust and safety. By meeting their early attachment needs, parents are supporting their infant in developing these parts of their brain. Infants can then learn to trust them, trust the world and not be afraid. The infant is learning about love. Every supportive, nurturing loving interaction a parent has with their baby helps them to build their brains. The old theory was wrong but with current research in neuroscience we are realizing the mistake. This has sparked the modern movement ‘attachment parenting’ as a result of understanding what the biological imperatives of an infant are. But it’s more than a parenting style or about baby wearing. It’s a way of being with an infant, attuned to them, responsive to their needs & communications. Infants communicate their needs very well. It’s the role of the parent to respond to that communication as much as they need to for as long as they need. Gradually their child’s capacity develops. Just like one day they roll over, crawl, and then walk. Today’s parents hear numerous opinions and theories when it comes to taking care of their child. It’s confusing. What helps is knowing the truth about their child’s experience and instinctual needs so they can best support their growth. With a solid foundation of secure attachment their infant will thrive on all levels. I teach a class ‘Making Sense of your Baby’ for expectant and new parents which addresses the science of attachment and teaches skills to nurture secure attachment.